Currents are powerful physical forces in the seas. They move water and heat around the globe, and help determine the chemical make-up of the water column. Currents also are a major factor in ocean ecosystems. Two types of current motion, upwelling and downwelling, strongly influence the distribution and abundance of marine life. Currents play a huge role in marine productivity, through a process called upwelling. Sea life is concentrated in the sunlit waters near the surface, but most organic matter is far below, in deep waters and on the sea floor. When currents upwell, or flow up to the surface from beneath, they sweep vital nutrients back to where they're needed most. Nowhere is the link between ocean circulation and productivity more evident than around Antarctica. There, strong currents pump nitrogen and phosphate up from the deep sea to fuel vast blooms of algae and other plants. These plankton are eaten by swarms of shrimp-like crustaceans called krill. Because of upwelling nutrients, krill are abundant enough to feed the largest animals on earth, baleen whales, as well as myriad penguins, seals, and seabirds. In fact, despite the harsh conditions, the biomass of Antarctic krill is thought to be greater than that of any other animal on Earth. The importance of upwelling to surface organisms is matched by the need of sea bottom life for downwelling, or the sinking of surface water. Surface water can be forced downward by the pressure of the “pile” of water that forms where currents converge or wind drives the sea against a coastline. But for bottom dwellers, the sinking of water caused by density changes is especially noteworthy. The global conveyer belt takes oxygen-rich surface water and flushes it through the deep sea. Without this renewal, the dissolved oxygen in bottom sediments and waters would quickly be used up by the decay of organic matter. Anaerobic bacteria would take over decomposition, leading to a build up of hydrogen sulfide. Few benthic animals would survive such toxic conditions. In the most extreme cases, a lack of downwelling may lead to mass extinctions. Paleontologists have suggested that 250 million years ago, deep circulation slowed nearly to a stop, and the ocean began to stagnate. Low oxygen, sulfide and methane-rich waters filled the ocean deeps and then spread onto the continental shelves, wiping out 95% of all marine species in the greatest extinction event in Earth history. Instructions: In this activity, you will explore the differences between upwelling and downwelling. Study the graphics and photographs illustrating upwelling and downwelling, then answer the questions about each process. Maps of the world’s major surface and deep currents are included as resources to help you understand where and how upwelling and downwelling occur. Most primary productivity in the oceans occurs in surface waters, but most of the organic matter is at the bottom of the sea. Explain. Almost all food chains begin with photosynthesis, and photosynthesis occurs in sunlight. So marine plants will only live near the surface where light can penetrate, and of course that will keep herbivores, and their predators, up at the surface too. But once these organisms die, or shed scales, eggs, leaves, shells, or feces, they and their byproducts will sink down toward the sea floor. 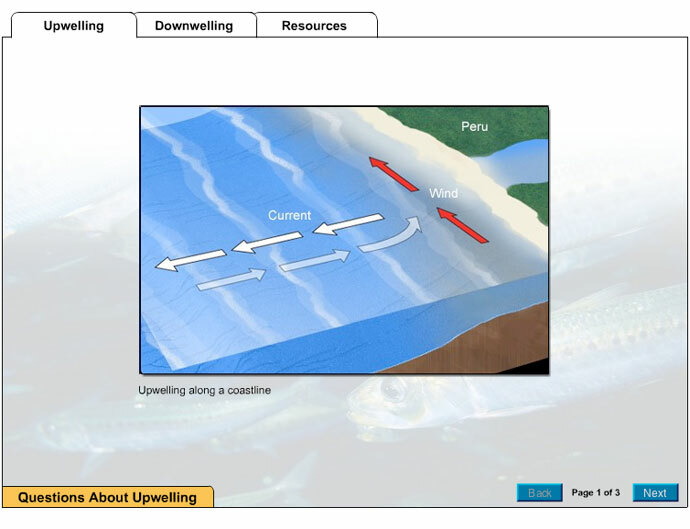 Upwelling occurs when surface currents move away from one another, or when winds push surface water away from the shore. This draws deeper water upward to replace the surface water. Why is nutrient upwelling so powerful around Antarctica? The deep water in the global conveyer belt flows across the seafloor all the way from the North Atlantic before it reaches Antarctica, so it has a lot of time to pick up a lot of nutrients. There are a lot of surface currents flowing around the continent - the southern limbs of the Pacific, Atlantic, and Indian Ocean gyres and the Circumpolar and Subpolar Currents - to stir up the water. And there are likely to be strong polar winds blowing offshore, which would also drive upwelling. What other conditions near the South Pole help stimulate lush plant growth? In summer, the sun shines non-stop, which would allow photosynthesis 24 hours a day. Downwelling occurs when the water on the surface of the sea becomes denser than the water beneath it and so it sinks. Seawater gets denser when it gets colder or saltier. Where does most downwelling occur? Most downwelling happens at the poles. There, cold air chills the water. The water brought in by the surface gyres is pretty salty already, because it comes from the tropics, where evaporation increased salinity. And once it gets to high latitudes, the water becomes even more saline as ice forms and further concentrates sea salts. Life on Earth nearly died out at the end of the Paleozoic Era 250 million years ago. At that time, all the continents had just come together to form a supercontinent called Pangaea, and a single superocean called Panthalassa. The global climate had warmed by several degrees, especially at the poles. How do you think these conditions might have affected ocean circulation, and led to low oxygen levels in the sea? The arrangement of the continents would certainly make circulation patterns different than they are today. For example, it seems like on the surface, there wouldn't be so many gyres, since there was only one giant ocean basin. There might have been more east-west movement and perhaps fewer north-south currents, since there were fewer continental barriers to flows driven by the prevailing winds. If the air was warmer at the poles, then the water would be too. And without cold water and ice formation at high latitudes, there would be little downwelling and not much of a global conveyer belt in the deep sea. So all in all ocean circulation would probably have been much weaker than it is today. Oxygen in the deep sea would have been used up, and without strong downwelling, there was no way to replenish it. Currents are important in marine ecosystems because they redistribute water, heat, nutrients, and oxygen about the ocean. At the same time, currents inevitably sweep over and carry off living organisms. Discuss how current flows might affect ocean organisms and species. Scientists seek to understand and explain how the natural world works. Many of the questions raised in this endeavor have no absolute answers. Although many sea creatures are powerful, efficient swimmers, many others are ungainly or even immobile. For these animals, currents could offer a free ride. Corals and sponges, for instance, are attached to the bottom as adults, but when they reproduce, they release volumes of planktonic larvae into the water column. These tiny creatures are free to "go with the flow" and could be carried long distances. This could allow individuals to escape overpopulated areas with too much competition for resources, and allow the species to spread into and colonize new habitat. Once the juveniles settle down, currents will continue to bring other plankton and organic debris their way, providing a steady supply of food. Even the free-swimming animals can benefit from riding currents. Many marine vertebrates such as herring, eels, and turtles, hatch in rivers or close to the coast. Small and weak, the juveniles need currents to carry them to the open ocean feeding grounds where they grow and mature. Because currents tend to concentrate food resources in limited areas, such as by upwelling, they make it easier for predators to find prey. But a reliance on currents - for transportation and for maintaining water conditions - could be the downfall of individuals and populations. When currents shift, because of plate tectonics or climate change, ecosystems would be thrown into turmoil. The young could be carried into areas where they could not survive, and adults could be bathed in water whose temperature, salinity, or chemistry they cannot tolerate.